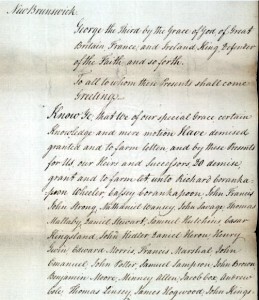 Cox and Cole's signatures on the land grant petition. 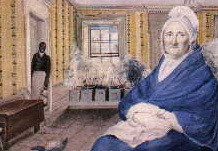 Joseph Stewart is in the background of this 1816 watercolor of Elizabeth Cooper by George Freeman. In the 1800s, in the DeLancey home on Heathcote Hill in Mamaroneck there was a prominent painting in the front hall of a black man. The family called him “The Governor.” With the assistance of the James Fenimore Cooper Society the Historical Society learned some more about the man in the painting. 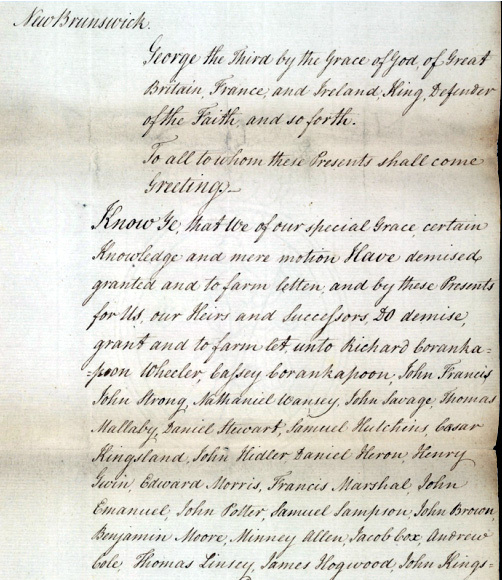 The Historical Society first wrote about Joseph Stewart in 2006, in an article titled Historical Society Finds More Slaves from Heathcote Hill. The article reported on slaves living wiwith the Delancey family, based on a 1883 essay by Susan Fenimore Cooper, the daughter of James Fenimore Cooper, titled Small Family Memories. Susan Cooper wrote the essay to describe for her grandchildren what it was like growing up on Mamaroneck’s Heathcote Hill during the early 1800s. 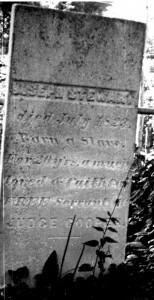 Secretary MacDougall also provided additional information about Stewart’s widow Harris would have lived on Pine Street (now Pine Boulevard) in Cooperstown, and as Susan Cooper says in the essay: “His wife Harris married again after his death, and lies in the Churchyard, near the front fence. My grandfather gave her a house and lot, on what is now Pine Street.” There is a section of the Village Graveyard (and later Christ Episcopal Church graveyard) once reserved for African-Americans along its eastern edge next to River Street. According to Secretary MacDougall, She may be the Harris Mann who is recorded in Christ Church records as dying in 1847 at the age of 77, and her second husband may have been Thomas Mann, a Free Black recorded in the 1830 US Census as aged 36-55, with a presumed wife of the same age and a presumed daughter aged under 10. 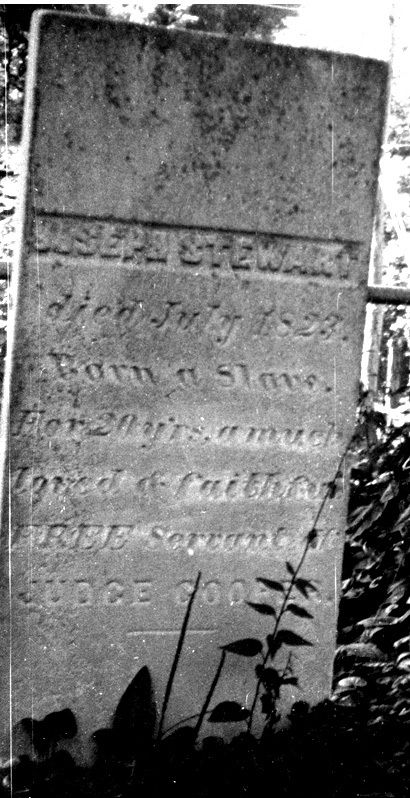 Joseph Stewart “The Governor” therefore never lived in Mamaroneck. According to Secretary MacDougall, Fred was sometimes known as “Frederic”. 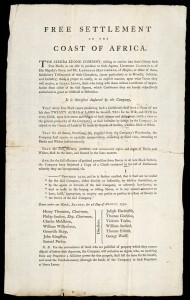 James Fenimore Cooper “rented” him from his older brother Richard. According to James Fenimore Cooper, The Early Years (New Haven, Yale University Press, 2007, pp. 150-151), Frederic “seems to have been one of the freed or indentured DeLancey blacks; his indenture had been purchased and he was taken to Cooperstown by Richard Fenimore Cooper, and in 1811 he returned with the Coopers to Westchester. While living with them, Fred was paid wages; eventually, around 1820 (before his indenture was up), he deserted them and they made no attempt to find him and bring him back.” Thus “Fred” may not have been a slave at the time he lived on Heathcote Hill in Mamaroneck. 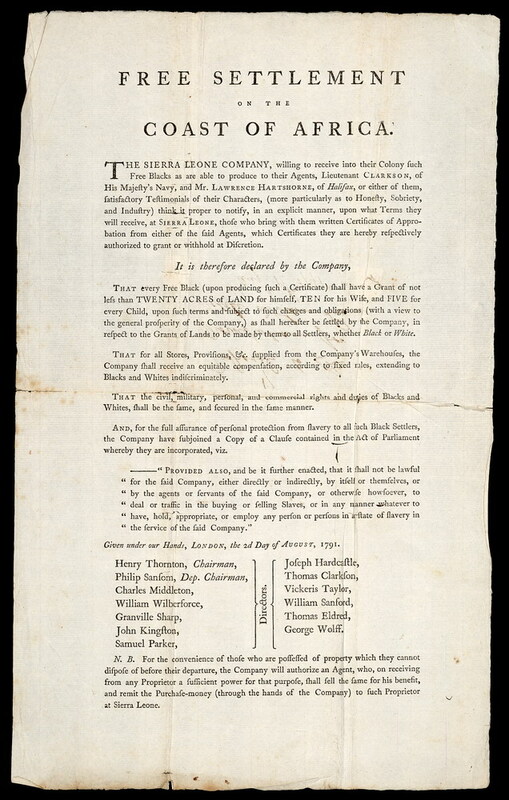 Rather he was an indentured servant, which meant that he had to continue to work for the Coopers until he satisfied the terms of his indenture, which arose because of his prior status as a slave. Notice is hereby given that changes are proposed to be made updating the Constitution of the Larchmont Historical Society. Such changes will be considered and acted upon at a meeting of the Members to be held at 8 PM on Tuesday, March 8, 2011 at 85 Larchmont Avenue in Larchmont, NY. Anyone wishing to see a copy of the proposed revised Constitution prior to the meeting may request a copy from Colette Rodbell, the President of the Larchmont Historical Society, at: president@larchmonthistory.org. First of all, welcome to the inaugural mailing of our “green” newsletter. We are happy to join the long list of organizations who have forged the way and hope that you enjoy our efforts. Secondly, welcome to our new board members Ned Benton and Susan Emery (who are returning after a year’s hiatus) as well as Beth Belisle, Jim Fleming, Monica Foster, Rick Lefever and Katherine Ann Samon. They each offer new energy and enthusiasm to our team and I’m sure you’ll be hearing more from them during the course of the year. In addition, I’d also like to welcome you to another year of great programs offered by the Larchmont Historical Society. While we traditionally take the summers off, this year we were busy planning for an exciting fall. The story of the beautiful American LaFrance Engine One continues as it is currently being restored in Maine, well on its way to returning to Larchmont where it will be once again serving the community in her original condition. The fundraising campaign continues with our Roaring 20″s Firemen’s Ball being held on Saturday, October 30, 2010! I hope to see many of you at this festive event! Our goals remain intact this year as we continue our series of events, add addresses to our growing list of Century Homes, develop our oral history program and our website, strive to increase membership and finally, celebrate spring with our wonderful spring house tour. We truly appreciate your support and welcome your participation. Whether you have an hour to give or would like to serve on a committee, please contact us on line at larchmonthistory.org 914 381 2239 or lhs@larchmonthistory.org.